Satin perfect’s extra wide head and textured ceramic discs remove more hair in one stroke, giving you the ultimate epilation experience! this deluxe model comes with 4 attachments and a pair of illuminating smart tweezers for the best in head to toe solutions. a built-in opti-light reveals even the finest hairs while the 2 speed setting gives you optimal speed control. enjoy cordless epilation for up to 40 minutes! don’t you want long lasting smoothness for up to four weeks? smooth in minutes, lasts for weeks! The travel lock is active: Press and hold the on/off button for 3 seconds until the speed setting indications flash white 2 times. The travel lock has been deactivated and you can press the on/off button to switch on the appliance. 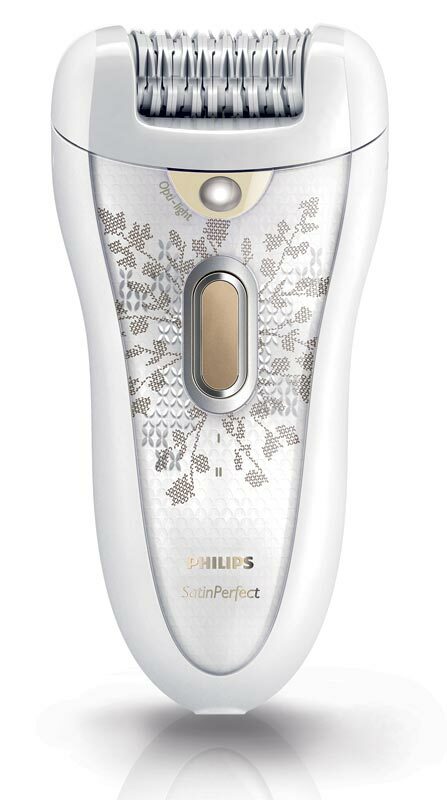 Designed to give you the ultimate epilation experience, the Philips Satin Perfect Deluxe Epilator has an extra-wide head and textured ceramic discs to gently remove more hair in one stroke. 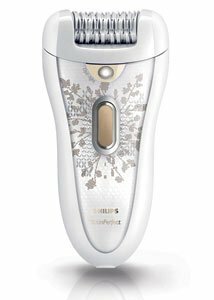 This cordless epilator provides up to 40 minutes of hair removal per charge. It’s safe for use on both face and body hair and will leave skin smooth for up to four weeks. Comfortable and efficient, the Satin Perfect Deluxe has an ergonomic head and built-in opti-light to reveal even the finest hairs. Two speed settings give you more control. The Satin Perfect Deluxe comes with four attachments and a pair of illuminating smart tweezers. Ergonomically designed to gently remove hair from sensitive areas. The Satin Perfect Deluxe Epilator removes body hair in sensitive areas, like under the arms and around the bikini line; on hard-to-reach areas like knees and ankles; and on facial areas such as the eyebrows and upper lip using the illuminating smart tweezers. Its hypoallergenic, textured ceramic discs catch and remove even the finest hairs quickly and comfortably, leaving you with smooth skin for up to four weeks. As gentle on skin as it is efficient, the epilator features an active hair lifter that makes even short hair stand up for easy epilation, while the massage system gently vibrates to stimulate and soothe skin. The speed control feature maintains an ideal epilation speed throughout the hair removal process. A built-in opti-light makes it easy to view fine hairs, and 32 textured ceramic discs effectively grip hair and prevent even the finest strands from slipping through the discs. The pivoting movement of the performance cap helps you keep the epilator at the ideal angle for best results. The Satin Perfect Deluxe also includes a shave, trim, and style attachment for close and smooth removal. A luxury tweezer set, ideal for eyebrow grooming, comes in an elegant case with integrated light and mirror. The epilator provides up to 40 minutes of performance on one charge and recharges in just an hour. Its cordless design means you can toss it in a suitcase or gym bag for easy, on-the-go use anywhere and everywhere. Thanks to its removable, washable shaving head, keeping the epilator clean and is quick and easy. Simply hold it under running water and clean with the included brush. Satin Perfect Deluxe Epilator, active hair lifter, active massage system w/ pivoting cap, shaving head, trimming comb, illuminated smart tweezers, charger, cleaning brush, and storage pouch.